One day I was reading one of my daily-go-to blogs (Lorelei Eurto) and I found a link to Lori Anderson’s blog that I need to admit I had not visited before. She was announcing to host a virtual BEAD SOUP PARTY. As I am always looking out for challenges, and contests, with the hope to win something (yes, I am an addict), it was clear that this one was not to be missed. So the plan was the following: Lori partnered all of us up in teams of 2 people. Each person had to send a set of beads to the partner, which had to include: A focal, a special clasp, and some corresponding beads. The focal and the clasp had to be used, we were free about the corresponding beads. Everybody had to make some jewelry, keeping the result secret until the big reveal. And today, Feb 10, is the big day, so this entire post is about the big reveal, and all of us 84 participants will be blogging about the party. See the links to the blogs below. So how excited can one be – yeah, I am accepted to participate out of Germany. There are actually a quite few people out of Europe, and even one (Dale) out of Korea. This is a truly global event, which makes it just so much more exciting. (Lori, I bet you never thought it would turn into something like that). My partner is the talented jewelry designer Mel Poxon from Kookie Designs. Please visit her blog here. She lives in the UK and is designing and selling jewelry, and is also a qualified nail technician. She uses a lot of lampwork beads in her designs, from very talented local designers. I appreciate Mel’s style since I think it is very colorful and rich, and I like her designs. I hope you do too. You can check out her Etsy shop here. She is also currently running an auction for Haiti on her blog, so one more reason to visit. She sent me a wonderful package of beads that I was overwhelmed with. I really like the colors – I am very much a person that wears a lot of blue. Each one of them is a treasure. Some of the talented designers of those beads are Jelveh, Emma Ralph, Julie Fountain of Lush Lampwork, Clare Scott, Cheeky Cherubs, Rob Johnson and Volcanic Lava, just in case you would like to order some of them for yourself. If I would not have to make something to a certain deadline, I would probably still sit here and play with them every day and imagine the things my beads can turn into one fine day. Now here is the tough part. What shall we make? 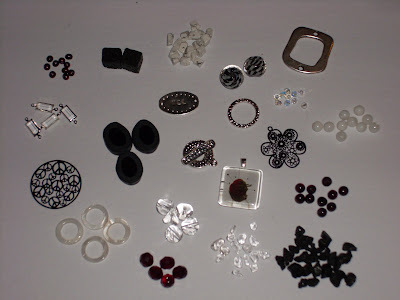 The jewelry I wear is usually more delicate, so I took a lot of time to think how I can use all the beads in one piece. Decision was taken pretty quick – I can’t. Although I had thought about using more of them together, some of those pretty beads are speaking to me: They want to be a bracelet (one that has yet to be made). And my own goal was to make a necklace for the bead soup party. So what will we end up with? A lot of weekends passed, but finally two pieces evolved in my mind. So for the big reveal, a necklace should be made. I started with the larger focal bead. The gold and blue tones made me want to use copper with it though, and my clasp to be used was sterling. This asymmetrical bead could have probably worked a couple of ways, but here I wanted to try something with coiled wire for the first time, and I love how it turned out. I used some of the beads from my own stash – svarowski sand opal rounds, and dark blue & copper shimmering glass beads, and some copper chain to create those dangles. The chain took another 3 weeks until I figured it out, actually it was just decided yesterday (I even tried to make some myself). In the end I used some copper chain, some copper spacer disks and some more svarowski crystals to repeat the blue from the focal. And the clasp made me very happy too – again made out of coiled wire. I love how it looks, and it was really easy to make. I called it Champagne Decadence necklace. But here we go – the rules were that I have to use the focal and the clasp. So I needed to make another piece. I used one of the other larger beads that reminds me of a sea urchin as the focal. This color works better with silver, so the clasp would go perfect with it. I thought about sand and water for a long time, and then with a lot of trial and error, this pretty necklace appeared. I was wearing it yesterday for a work dinner with my hair down – and oh my god, did I love this look. It hangs pretty short but fits the length of my hair perfectly. Epilogue: Want to see more? Thank you Lori for hosting this wonderful event. I am so sad it’s over. When do we do the next one? Shall we alternate the people organizing it? I will volunteer for sure. This has been so much fun, and seriously, has been so well organized. A big hug across the ocean from me to you. The party would not be a party if it was only me. So please go to see the other 84 (!) pieces of jewelry that people have created. Links to their blogs are listed below. Have fun checking them out. 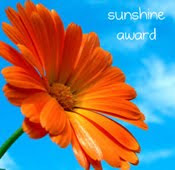 And leave a comment and please revisit my blog. And thanks again to you, Lori, for all that fun. A happy day to all of you. Nicki. 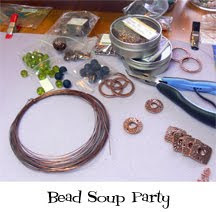 47 Response to "Bead Soup Party - THE BIG REVEAL"
Nicki, these are absolutly stunning! How imaginative and creative! I love them both! I would hard pressed to say which is my favorite piece! Great job! This is what I love best about Bead Soup...coming across post's like yours! Your pieces are wonderful as is the descriptive breakdown. I love it! Very creative! Love how you put these together. You are welcome to stop by for a cup of “Spring” soup on my blog. I completely love it! Well done! Thanks for being a part of the party -- we'll do it again soon! February 10, 2010 at 8:20 PM This comment has been removed by the author. Outstanding and so well done! You are so talented....I love everything about them! This is a great soup party! I love the bail that you made for the second piece, it looks so cool with the lampworked bead. Thanks for adding some international flair to the party!! Excellent job! thanks for the cup of soup! very nice - i love them both and how you arrived at your design decisions... really cool! Both those pieces are really fun! These designs are wonderful! Love your wire work! Very creative designs! Love them both! Love reading about your thought process and love the results of the thoughts. Great designs! Two great necklaces. Love reading about your thought process. you did some really Very lovely pcs!! Im loving what you did! Nice work! I really like the wire and metal work you have done! Thanks for sharing! love the pieces, they are gorgeous!Sometimes you just have listen to the beads! Wonderful job, Nicki... they're both lovely pieces! Two worth bead soup pieces and I love the way you blogged about the journey. I love both pieces..wonderful job. Great wire work and love the toggle. I love what you did with the focal beads as well. Great job, nicely done! Beautiful, earthy necklaces, I love them both! Well done! A nice mix of wire wrapping, chain and dangles. Glad I don't have to choose, 'cause they're both great! Wonderful detail in your wire wrapping~ very nicely done. Both necklaces are stunners! Nicki, you made two outstanding pieces of jewelry! Well done! love the wirework, great designs! Oh My Gosh! I LOVE how you did that dangle! Very Cool! Very nice - I love both of them, but the second one speaks to me! Sometimes a little trial and error isn't a bad thing! The dangle makes it look like a piece that would be fun to wear with a V-neck. Nice job! I really like these. I love anything with danglies and, the way you framed the focals adds that special something. Nice work! Hello to you in Germany! This bead soup exchange makes it a very small world. I love your beautiful creation and all of your talent in wirewrapping. Great job. Love the creative way you seated the focals in both of your pieces. I will have to remember those technique when my lampwork beads get better. . . .Sorry for the delay in getting to your blog. Enjoy your necklaces! Little over-achiever! ;) I like the two designs. They are both complicated in design and yet simple at first glance. Very pretty. Hello everybody, thank you so much for all your kind comments. And please come back in the future. I am happy to have met so many very talented designers. 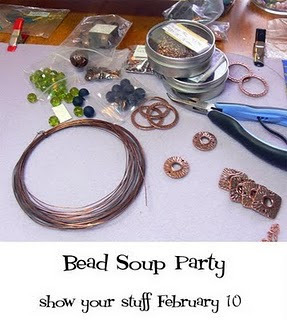 See you at the next bead soup party?